Pill Hill is a residential neighborhood that got its name because of its close proximity to the Longwood Medical Center and its high population of doctors and hospital employees. 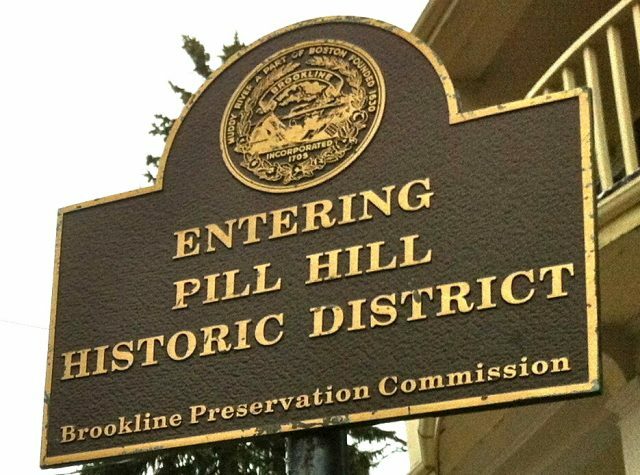 The Pill Hill Local Historic District is in the southeast section of Brookline, just a few minutes walk to the Brookline Village T stop on the MBTA Green line. It borders Frederick Law Olmstead’s infamous Emerald Necklace, Boylston Street, Brookline Village, and Oakland Road. The majority of houses in the area were built between 1870 and 1930, and the neighborhood is home to some beautiful examples of Victorian, English Cottage, Colonial Revival, Mansard and Greek Revival architecture, including stick and shingle style edifices. The streets of High Street Hill boast beautiful views and serve as a quiet respite from the busy streets of Boston for its residents. Much of the landscaping around these homes is inspired by Olmsted himself such as the Charles Storrow House and the Philbrick Estate. Many of the homes sit harmoniously on winding roads, although each representing a unique character that is well maintained with historical accuracy. The area not only holds the historic architecture and landscaping in high regard, but it also prizes itself on the intellectual circles that first resided there and still do today. Pill Hill was home to one of the area’s first women’s hospitals, The Free Hospital for Women, which has been located on Pill Hill since 1895. This hospital was the first to use radiation therapy on cancer patients.